Issyk-Kul is the nonfreezing mountain miracle lake of the tectonic origin, situated in a deep mountain hollow between the ridges of the Kyungey Ala-Too and the Teskey Ala-Too range at an altitude of 1609 meters above sea level. 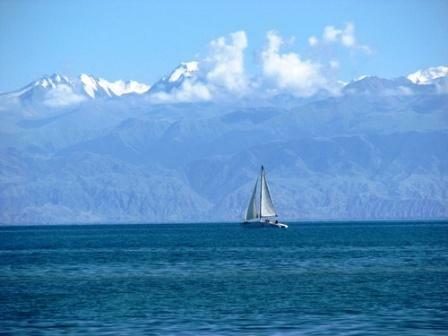 Lake Issyk-Kul refers to the lake, formed by a tectonic way, and as a result of orographic closed basins. The climate is distinctive, almost maritime. It is softer, warmer and damper than in other basins of the Tien Shan Mountains, located at the same height. The rare combination of the unique climate is in the valley: maritime, steppe and mountain, and zones of eternal glaciers. Issyk-Kul – one of the greatest and beautiful high mountain lakes of the world (170 km. high and 70 km. wide, the second biggest mountain lake in the world after Lake Titicaca in South America). “Issyk Kul” translated from the ancient Turkic languages means “holly, secret lake”, and from the Kyrgyz language it translated as “warm lake”. Because of the large depth of the lake water does not become completely cool - the lake never freezes, except some places in shores. In the area of the resort Tamga on the south coast the water temperature does not exceed 20 degrees. 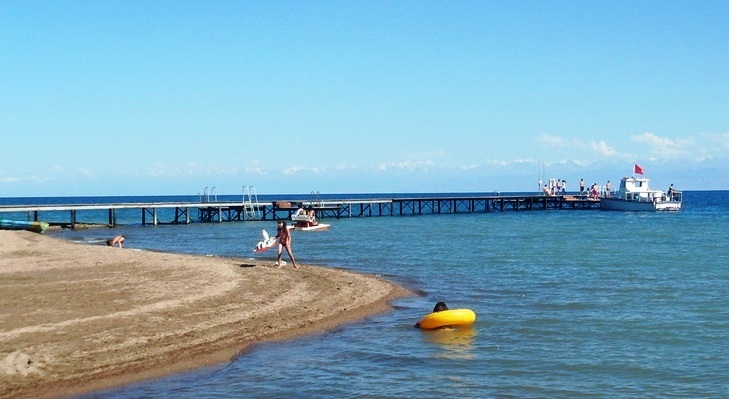 Issyk-Kul is famous for warm beaches, thermo - mineral radon sources, alpine meadows and huge coniferous forests. The coastline of the lake is strongly indented, but because of this there are about 20 beauty bays and coves. It is also well-known for its healing properties. Crystal clear water, mineral sources in combination with mountain, but at the same time soft, almost sea climate, create perfect conditions for resort rest with additional opportunities of mud and thermal treatment. About 80 rivers run into the lake, but no any flows out. In this reason the lake is salty (the water salinity is 5,8 %). About 10 billion tons of various salts are dissolved in the lake waters. That is why from the ancient time people came here not only to have a rest on the coast of the natural phenomenon, but at the same time for the health-improvement. This lake is like a jewel, lost among high snow-capped mountains. Lying on the shores of the warm lake, it is very hard to believe that somewhere on the contrary, in the next five thousand meters the eternal snow lies. In winter the lake is the shelter for swans, geese, ducks and cranes.